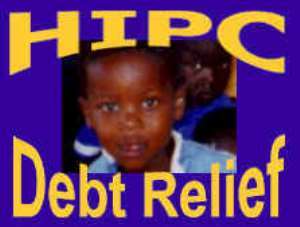 .... $3.7B BENEFITS IN THE OFFING Ghana will next month reach the completion point of the Heavily Indebted Poor Countries (HIPC) Initiative and gain 3.7 billion US dollars in debt relief in nominal terms. By this, Ghana's debt relief will be spread over a period of 20 years. For reaching the completion point, however, the country will have an immediate debt relief of $1.5 billion. This was disclosed to the Times in Accra last Wednesday, in an interview with British High Commissioner Gordon Wetherell. Mr Wetherell said: “This year alone, Ghana will benefit from about 150 million pounds sterling in debt forgiveness, giving a significant boost to the resources available for development. The Times had sought the views of the High Commissioner on a wide range of subjects, including Ghana's decision to opt for the HIPC Initiative and the significant role played by the British government in supporting Ghana's move in that direction. He emphasized that all the Ghanaian key players appreciate the tangible benefits of HIPC in the form of new school blocks, health and sanitation facilities dotted around the country. On the application of the HIPC package and whether there was the need for a policy redirection or change, the High Commissioner said that it was important that HIPC administration was integrated into other processes for agreeing development expenditure. He said, for instance, that the decisions and plans of district assemblies or the Ghana Education Service could be dove-tailed into the management of the programme to ensure effective and efficient institutional linkages at all levels.